One sound. Raw, simple, natural. Adapting it, transforming it, and capturing it. Giving it a sense, a dimension, an identity. Confronting the issue of gesture, whether musical or choreographic. In a constant search for innovation beyond classical percussion, it is this mixture of artistic language that formed the SR9 trio. Their eclectic artistic realm includes the areas of dance, theater, music and electronic music in a process which is constantly renewed. SR9 defends a creative vision of contemporary percussion and its evolution through lively performance. Created in 2010 at the Conservatoire National Supérieur de Musique de Lyon in the class of Jean Geoffroy and Henri-Charles Caget, the trio was born out of a friendship between Alexander ESPERET, Nicolas COUSIN and Paul CHANGARNIER. SR9 won First Prize at the International Percussion Trio Competition in Luxembourg in 2012, as well as the Audience Award and Interpretation Award for Jean Batigne’s work, Parcours. They were also winners of the European Musical Ensemble Competition of FNAPEC in 2012. 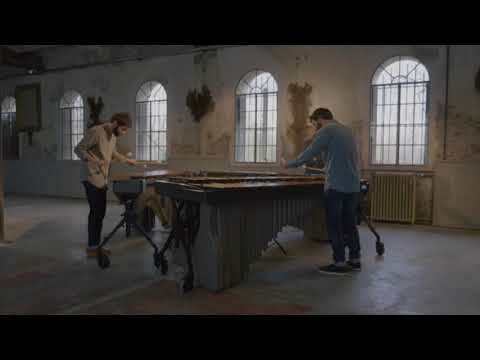 The SR9 trio plays Adams Alpha marimbas exclusively.